Running since 1992, this bizarre festival has its roots in the less humourous custom of pillaging neighboring villages for womenfolk. A 19th-century brigand called Ronkainen was particularly keen on the practice. Today, aspiring Ronkainens will be disappointed to discover they’re not allowed to keep their partner in the end, unless she is actually their wife, of course. The good news for unreconstructed bandits is that the course offers plenty of opportunities to prove manly prowess. Over a distance of 253.5m, contestants must tackle sand, grass and gravel surfaces, two dry obstacles and a 1m-deep water section. The only equipment carriers are allowed is a belt and they receive a 15-second fine if they drop their load. While runners-up are consoled with awards for the most entertaining couple, the best costume and the strongest carrier, the winning couple receives the woman’s weight in beer and a range of wife-carrying memorabilia. 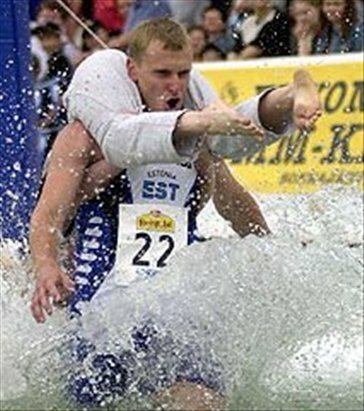 Gluttons for punishment can also tackle the 100m sprint and the relay, in which men have to down a special ‘wife-carrying drink’ when they pass their man-sized baton. Essentials: ‘Wives’ must be aged over 17 and weigh more than 46kg. Local Attractions: Relax after wife-lugging exertions in that fine Finnish invention, the sauna. Finding one should be easy – there are 1.6 saunas per Fin.